I made these two flower themed lunches on different days a while back, and very early in the mornings when there was no sunlight. I am so glad that it's Spring now so the mornings are better for taking a decent photo. 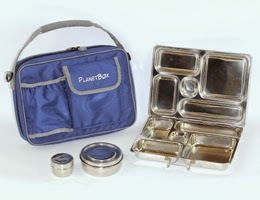 The first bento was breakfast for lunch. It was mostly food from my freezer stash which I heated up with the Eggo pancakes and sausages in the microwave before transferring it to his Planetbox Rover. Main compartment - Eggo mini pancakes with candy eyes and strawberry mouth. 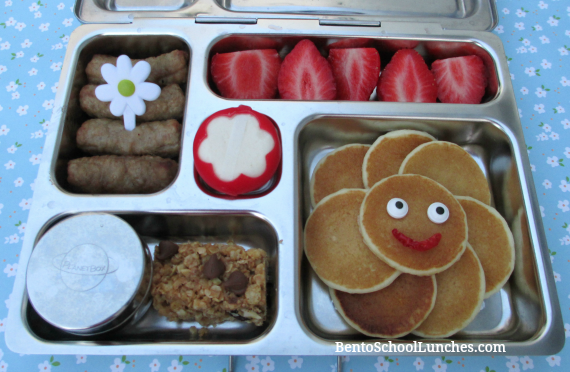 Upper left - Sausages with a flower cupcake pick. Lower left - Organic pure maple syrup in the dipper and half of a homemade granola bar. Center - Babybel cheese with a flower cutout. Main compartment - Flower shaped sandwich which I used a small circle cutter for the center cutout..
Upper left - Babybel cheese with a flower cutout and Annie's organic cheddar bunnies. Lower left - Flower shaped cucumber slices with baby carrot slices. 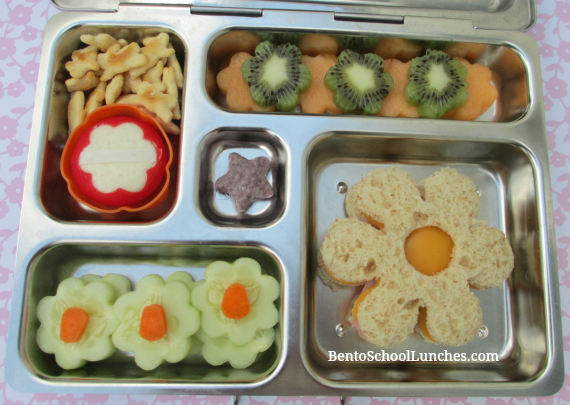 Upper right - Flower shaped kiwi and cantaloupe slices. Lovely spring lunches! So pretty!